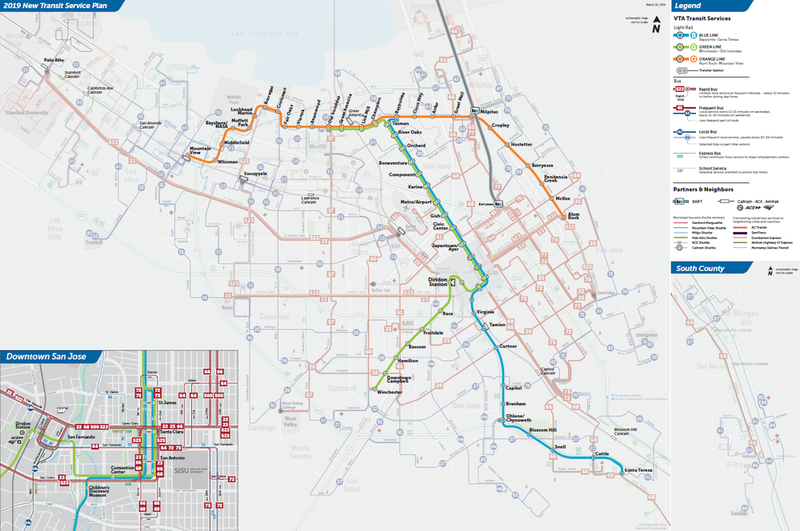 As part of the frequent network, light rail routes would operate at 15-minute frequency on weekdays and 20-minute frequencies on weekends (to match 20-minute BART frequencies), except in the early morning and late evening when service would be less frequent. Two station names would be changed. I-880/Milpitas Station would be renamed to Alder Station. Montague Station would be renamed to Milpitas Station as it is adjacent to the Milpitas BART Station. The Alum Rock-Santa Teresa light rail line is proposed to be renamed to the Blue Line. The Blue Line would be shortened to end at Baypointe Station instead of the Alum Rock Transit Center. Current riders east of Baypointe Station would be served by the new Orange Line. The Mountain View-Winchester line is proposed to be renamed to the Green Line. The Green Line would be shortened to end at Old Ironsides Station instead of Downtown Mountain View. Riders who currently travel west of Old Ironsides Station would be served by the new Orange Line. The Orange Line would be a new light rail route connecting the Mountain View Transit Center and Alum Rock Transit Center. The Orange Line would connect with BART at the Milpitas BART Station. The Ohlone/Chynoweth - Almaden line would be discontinued and replaced with Route 64a and Route 83.